Once known for its powerful industrial sector, today the Great Lakes region is a hotbed for entrepreneurship and innovation. Just hang out in Cleveland for a few days and meet driven young entrepreneurs, listen to the heartbeat of a global water industry centered around the largest freshwater system on Earth, saunter into world-class restaurants, and shop at farmers markets and food co-ops. Out in the countryside, our farms thrive across Ohio, Indiana and Michigan, where the grass is greener for Organic Valley farms. We know our small farms and hard work make a difference to the health and well-being of our communities and families around the Great Lakes. It makes getting up before the sun every day worth it. The cooperative spirit is at its best here, where so many of our Plain Community farmers live and work the land. After all, cooperation and community are bedrock principles of farmers’ faiths. If disaster strikes in the community, we are there with food, building material, our time and ourselves to support our neighbors. Every year, an auction is held for the DDC Clinic in Middlefield, Ohio. DDC Clinic helps children with rare genetic disorders regardless of a family’s ability to pay. Organic Valley farmers Mark and Marian Martin started this auction 16 years ago when Marian’s niece fell ill from a genetic liver disorder and the family needed to raise money for hospital bills. You’ll see hundreds of people, including more than a couple of our farmers, donating quilts, furniture and time to the auction. 100% of the proceeds go directly to DDC Clinic. Local farmers are unsung heroes. And we decided to put our heroes front-and-center on our milk packages. 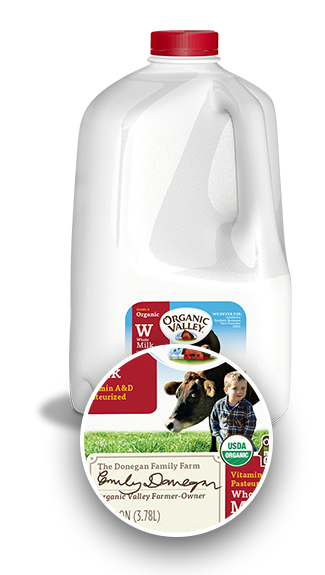 The farmers you see on our milk cartons throughout the Great Lakes are real farmers. With real lives. Making real differences in communities across the region. Their hard work and dedication turns into the organic milk your pour into your glass. Our financial support to the Michigan State University Upper Peninsula Research and Extension Center could benefit farms in many states. One of the center’s focuses is to increase organic grain production through on-farm field trials and development of best practices, developing and distributing educational resources, and providing marketing support and processing workshops. Organic Valley farmers collaborate with the Dairy Grazing Apprenticeship independent non-profit program to mentor aspiring organic dairy farmers through peer discussion groups and professional development training. Recently, the Dairy Grazing Apprenticeship program expanded this project to include 12 states in the Midwest and Great Lakes region.